Some 300,000 children are receiving vaccinations against polio and measles at one of the largest refugee camps in Kenya. They also are receving vitamin A and de-worming tablets as health workers try to protect the children against deadly viral and parasitic infections. Severe malnutrition has blinded one child, but her mother still hopes she will survive. "I pray so that she gets back on her feet here, otherwise there is not much I can do but leave it all to God," said a mother. Yet another child has met an all-too-familiar fate. 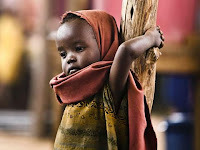 She is among the 40 to 50 children who the United Nations estimates die every day from malnutrition on the Horn of Africa. Josette Sheeran, executive director of the U.N. World Food Program, says the epic drought often forces mothers to abandon weak children as families walk for days to get to refugee camps in Kenya and Ethiopia. “About one out of four are really in dire conditions and if children get to level four malnutrition only about 40 percent can even be revived," said Sheeran. Pediatricians warn that malnourished children are susceptible to infections and that mortality is particularly high among children under five. Dr. Peter Hotez is a tropical disease expert. Dr. Hotez says that in addition to their urgent need for food and shelter, these children also need essential vaccines. “Measles vaccines, possibly cholera vaccines as well, the meningitis vaccine - remember this is not too far from the meningitis belt of Africa so immunizing against meningococcus A," he said. "And then we want to provide hepatitis control so hepatitis vaccination would be ideal." Health experts also advise sleeping under insecticide-treated bed nets to prevent deadly outbreaks of malaria in overcrowded refugee settings. 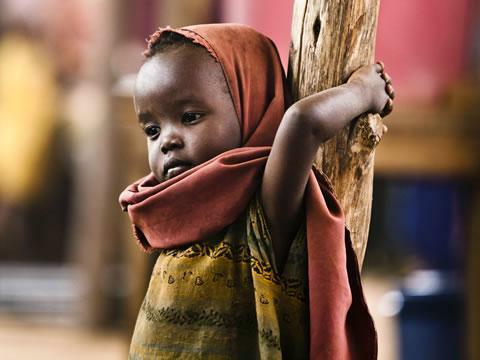 More than two million children are at risk of malaria and kala-azar in famine stricken Africa.